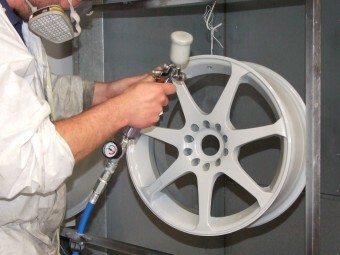 Wheel Refurbishment in Cornwall, Devon and The Southwest. 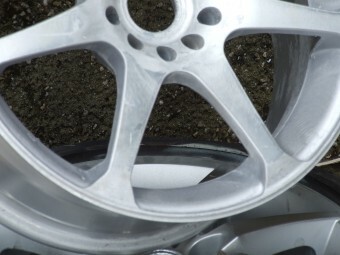 Badly corroded or damaged wheels can completely ruin a cars appearance. 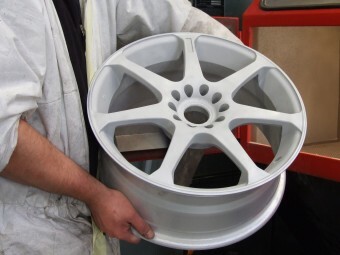 For lesser damage, such as a chip or minor kerb damage please see our wheel repair service page. 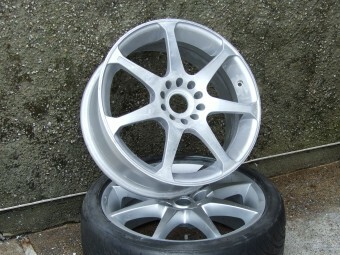 Complete Refurbishment from £50.00 per wheel. 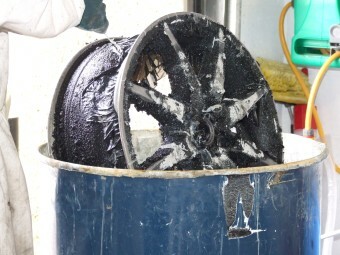 Corrosion & Damage - This wheel has corrosion, through either regular use of an acidic wheel cleaner or failure of the wheel coating allowing moisture in, there is also some kerbing damage to the wheel and it has had a poor quality refurb as well. 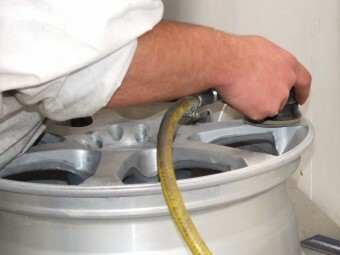 Preparation - Before doing anything, the wheels are cleaned and degreased so that they can be thoroughly inspected for damage. 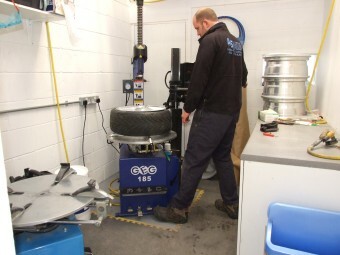 The tyres are removed, along with the valve and balance weights. 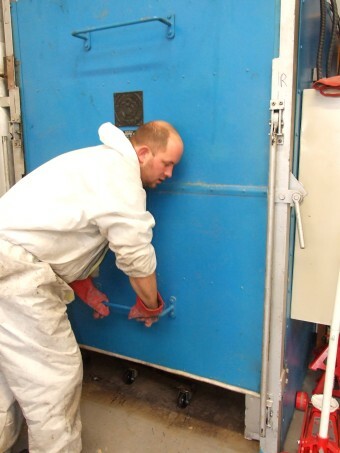 Dipping - The wheels are put into a dip tank, where the chemical inside strips the previous layers of paint and removes corrosion. After a few minutes they are removed and pressure washed clean to remove the old layers of paint and to neutralise the chemicals. 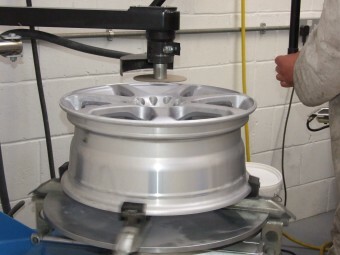 Damage Repair - After inspecting for damage the wheel is mounted on the grinding jig and using our special grinding machine, the damage is ground out to leave a nice smooth finish. Any severe damage is metal filled and left to cure for 24 hours before being sanded and reshaped. At this stage as much corrosion that is accessible is removed. 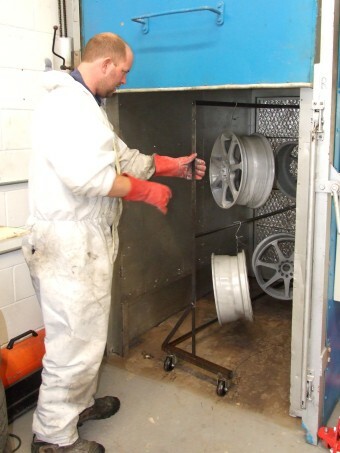 Blasting - The wheels are then blasted to remove any remaining corrosion, old paint and to provide a nice, keyed surface for the new coating. 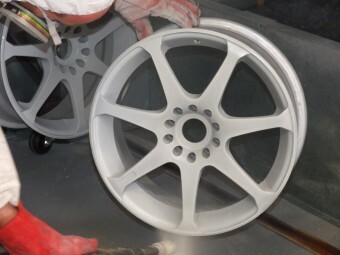 Powder Coating - Following the blasting the wheels are given a wash down to ensure there is no blast media present. The wheels are then mounted on a rack and placed in our oven. 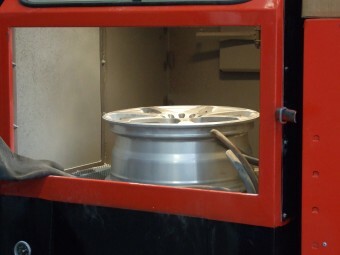 The wheels are brought up to the perfect temperature for applying the powder coat. 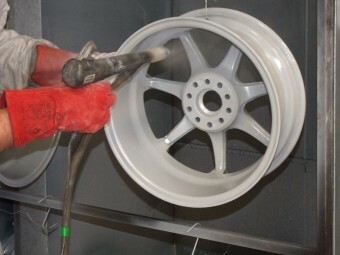 When the wheels have reached the correct temperature they're moved to the powder coat booth where a coat of powder coat primer is applied. 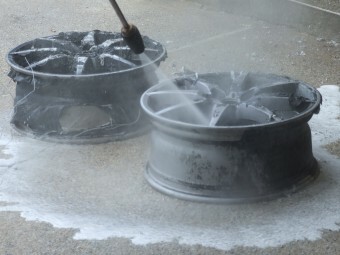 The wheels are then returned back to the oven to bake the coating. 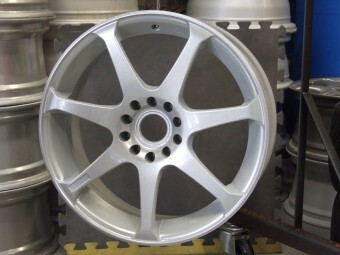 Once baked the wheels are moved back to the booth for colour coating and the procedure repeated for the clear powder coat. 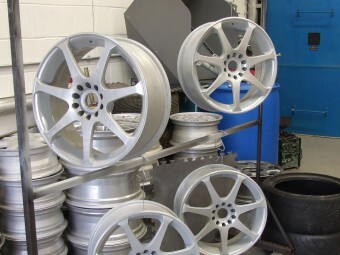 Once the clear powder coat has been baked, the wheels are removed from the oven and left to cool and finish curing. They are then ready to have tyres fitted, new valves and balanced. The movie below shows the coating process in more detail.